With gas prices climbing daily, many commuters are looking for a more economic (and ecologically responsible) way to travel. Treehugger reports that the City of Montreal has launched one possible solution: the Public Bike System. 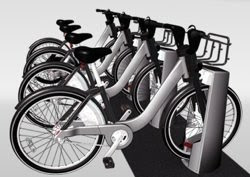 The Public Bike System is comprised of modular units that can be moved and added to as needed depending on volume. Users visit a web site to locate a rental unit close to their location and get a real-time update detailing how many bikes are at that location. With an access card or credit card, they can then choose a bike and rent it for any length of time, simply returning it to another station when they reach their destination. The software behind the Public Bike System tracks every bike in the system, gauging how many bikes are at each location and the functional status of each bike, as well as the status of solar panels running the system and the electronics. Users can alert the system from the rental units if a bike is damaged, and the stats are monitored for traffic and usage patterns, allowing for stations, docks, and bikes to be redeployed as needed. The bikes themselves have a sturdy, weather-resistant design that includes an aluminum frame, with all cables and derailleur covered. Lighting on the front and back of the bike is always on for additional safety, and the bikes dock with RFID connection. Because the stations and docks run on solar power, they can be placed anywhere in the city and relocated as needed without worrying about connection.